Being able to watch The Enemy of the World as moving images has greatly improved the story’s reputation. The previously orphaned Episode 3 is far from the most exciting instalment, and it doesn’t show the serial in the most favourable light when viewed in isolation. Soundtrack recordings exist, as do off-air stills known as tele-snaps, and so many fans – myself included – have been able to experience the story in the form of a narrated CD release or as reconstructions. However, many fans simply don’t enjoy narrated soundtracks or reconstructions, so this is their first chance to experience the true might of The Enemy of the World. Having pored over the soundtrack and tele-snaps several times before, the above plot elements were not new to me. Even so, watching the complete episodes proved to be a revelation. Tele-snaps and reconstructions cannot convey the full excitement of the pre-filmed footage at the serial’s start (almost ten minutes of slick location work) and end (the dramatic final confrontation between the Doctor and his doppelganger). Nor can they communicate the Doctor’s delight when Astrid (Mary Peach) tells him, “To me you’re the most wonderful and marvellous man that’s ever dropped out of the skies.” I never knew before now that the excited Doctor clicks his heels with glee as he gallivants across the beach, or that Victoria is rooted to the spot in sheer terror at the unfamiliar sight of a helicopter. Nor did I know that the year is 2018, which is revealed by the helicopter registration and a scrap of newspaper discovered by the unfortunate Swann (Christopher Burgess): 2017 is said to be “last year’s date.” Episode 4 proved particularly interesting for me, since no tele-snaps exist from this instalment, so the visuals were entirely new – even the cliffhanger ending to this episode was not quite what I was expecting! It’s not all perfect, of course. As is common with multi-camera studio-based productions of the time, there are a few boom microphone shadows in evidence, especially during Episode 2, some very flat-looking “brick” walls in Episode 4, and a wobbly doorway in Episode 6. The final episode seems a little rushed – more time could have spent with the underground dwellers, perhaps by introducing them at the end of Episode 3. While I’m quibbling, I am disappointed by the lack of extras on this DVD. The only special features are subtitles for the hard of hearing and a trailer for The Web of Fear. There is no audio commentary, production subtitles, or even the original BBC trailer for this serial (which would have been fairly easy to reconstruct from the extant soundtrack and recovered footage). I realise that secrecy was an issue while preparing this DVD, but the cynic in me suspects that a special edition will follow in a year or so, complete with commentary and documentaries. Generally, though, this is a must-see for classic Who fans. The restoration team’s efforts to renovate these decades-old film recordings show up better on DVD than they could possibly do on iTunes. 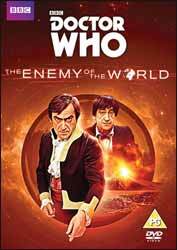 The Enemy of the World is an excellent story, one of my favourite Troughton serials, and it makes a nice change from an otherwise formulaic season of “base under siege” plotlines. As Astrid herself might have put it, to me these are the most wonderful and marvellous episodes that have ever dropped out of the skies!